A detection station for seismic activity at Bilibion, a remote corner of Russia. Apart from escalating global fears about conflict, North Korea’s recent nuclear tests have raised questions about geological events caused by underground explosions. Some media reports suggest the tests triggered earthquakes in South Korea. Others report the explosions may trigger a volcanic eruption at Paektu Mountain, about 100km from the test site. So can an underground test cause an earthquake? The short answer is yes: a nuclear explosion can cause small earthquakes. But it is unlikely to affect the earth’s tectonic plates or cause a volcanic eruption. Although a nuclear explosion releases a lot of energy in the immediate region, the amount of energy is small compared to other stresses on tectonic plates. Tectonic plates are slabs of the earth’s crust which move very slowly over the surface of the earth. Mountain ranges form at the edges of the plates when they collide, and ocean basins form when they move apart. Tectonic plates are slabs of the earth’s crust. Volcanoes occur mostly where plates are colliding. One plate overrides another, pushing it down to where it may partly melt. The partially melted rock – also known as lava – then rises to the surface, causing a volcano. The movement of tectonic plates also causes earthquakes, which is why 90% of them occur at the plate boundaries. All but the deepest earthquakes occur along faults, which are breaks in the crust where rocks can move past each other in response to stress. This stress can be from both natural events and human activities. “Induced seismicity” is the term used to describe earthquakes caused by human activities. Human induced earthquakes can be caused by anything that changes the stresses on rocks beneath the surface. These include processes that add or remove great loads from the surface, such as mining, building dams or tall buildings. Other processes that change the amount of pressure on rocks can include fluid injection from drilling, or extraction of water from aquifers. Human-induced earthquakes have been reported from every continent except Antarctica. Induced earthquakes only occur where there is already some stress on the rocks. The human activity adds enough stress to the rocks to reach the “tipping point” and trigger the earthquake. Nuclear explosions can induce small earthquakes along existing faults near a test site. Some underground nuclear tests have fractured the ground surface above the explosions, causing movement on faults adjacent to explosion sites. The 3 September 2017 North Korean nuclear test generated shock waves equivalent to a magnitude 6.3 earthquake. Eight minutes later, a magnitude 4.1 event was detected at the same site. This may have been linked to a collapse of a tunnel related to the blast. Several small earthquakes measured since the event may have been induced by the nuclear test, but the largest is only a magnitude 3.6. An earthquake of this size would not be felt outside of the immediate area. The largest induced earthquake ever measured from nuclear testing was a magnitude 4.9 in the Soviet Union. An earthquake of this size can cause damage locally but does not affect the full thickness of the earth’s crust. This means it would not have any effect on the movement of tectonic plates. Historical data from nuclear testing (mostly in the USA) shows that earthquakes associated with nuclear testing typically occur when the explosion itself measures greater than magnitude 5, 10–70 days after the tests, at depths of less than 5km, and closer than around 15km to the explosion site. More recent studies have concluded that nuclear tests are unlikely to induce earthquakes more than about 50km from the test site. Concerns have also been raised about the risk of volcanic eruptions induced by the nuclear tests in North Korea. Paektu Mountain is about 100km from the test site and last erupted in 1903. Mount Paektu is an active volcano on the border between North Korea and China. In the 1970s, the USA conducted a number of nuclear tests in the Aleutian Islands, a volcanic island arc chain containing 62 active volcanoes. One of the blasts, named Cannikin, was the largest underground nuclear test ever conducted by the USA. There were fears that the blast would cause a huge earthquake and tsunami. The blast did result in some induced earthquakes, but the largest was a magnitude 4.0 and there was no increase in volcanic activity. Based on this evidence, it seems unlikely a nuclear test by North Korea will trigger an eruption of Paektu Mountain. If the volcano was on the verge of erupting, then an induced earthquake from a nuclear blast could influence the timing of the eruption. However, given the distance from the test site then even this is not likely. The Comprehensive Nuclear Test Ban Treaty Organisation (CTBTO) has a global monitoring system to detect nuclear tests, including seismometers to measure the shock waves from the blast and other technologies. Global network of seismic monitoring stations. Seismologists can analyse the seismic data to determine if the shock waves were from a naturally occurring earthquake or a nuclear blast. Shock waves from nuclear blasts have different properties to those from naturally occurring earthquakes. Testing was much more common before the CTBTO was formed: between 1945 and 1996 more than 2,000 nuclear tests were conducted worldwide, including 1,032 by the USA and 715 by the Soviet Union. Since 1996 only three countries have tested nuclear devices: India, Pakistan and North Korea. North Korea has conducted six underground nuclear tests at the same site between 2006 and 2017. When wetlands flood they become full of life. They are spectacularly beautiful and noisy. There is nothing quite like the sound of a wetland when thousands of birds come together to take advantage of the newly created habitat. Ibis, spoonbills, egrets, herons, cormorants and pelicans all congregate in large numbers, tens to hundreds of thousands, to breed when wetland conditions are good. These gatherings of birds are spectacular, but a mystery remains: where do they come from, and where do they go? These questions aren’t trivial. 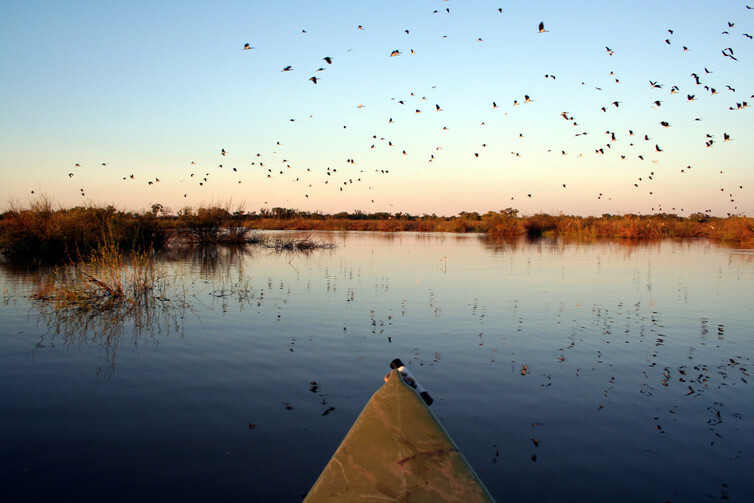 Over the past 30 years waterbird populations have declined as opportunities for breeding have disappeared, mainly due to water resource development. Worldwide, wetlands have been lost or are under threat from water resource development, agricultural development and climate change. In Australia we have lost an estimated 50% of wetlands since European settlement. The loss of wetlands has serious implications for wildlife. Many species are wetland-dependent throughout their lives while others, such as some species of waterbirds, rely on wetlands as places to breed. Knowing which wetlands waterbirds use when they aren’t breeding will help us figure out which places we need to protect. So the Centre for Ecosystem Science, UNSW and the Australian Nuclear Science Technology Organisation have developed a new technique to analyse Australian bird feathers using nuclear physics. Now we want you to send us waterbird feathers so we can build an Australia-wide map of where our waterbirds go. Traditional tracking methods such as leg banding and satellite trackers have had limited success and can be expensive. So we looked for a cheaper and more effective method. And what could be easier than collecting bird feathers? Feathers are made of keratin (the same material as human hair and nails) and as they grow record the diet of the bird in chemical elements. Once fully grown, feathers are inert – they no longer change. Chemical elements (carbon, nitrogen, hydrogen, oxygen) exist in a number of different forms known as isotopes. Some isotopes of some elements are radioactive, but many elements have stable, non-radioactive isotopes. The relative proportion of different isotopes can be explicitly linked to a specific location, as has been done for monarch butterflies in North America. To test whether this could be applied to Australian wetlands and waterbirds I did a pilot study in 2010-11. Widespread flooding in the Murray-Darling Basin resulted in colonial waterbirds breeding at a number of wetlands including the Gwydir wetlands, Macquarie Marshes and Lowbidgee wetlands. These three wetlands are geographically distinct, spread across the Basin from north to south. We used feathers from chicks and juveniles, because they are eating food from only the wetland where they were hatched and so provide a unique signature for that wetland. We tested the feathers using two techniques: one to look at the elemental composition of feathers, and the other to measure the amount of two particular isotopes, carbon-13 and nitrogen-15. Results from these analyses showed that we were able to distinguish between the three wetland sites based on the elemental composition of the feather and the isotopic composition. Either technique showed the ability to distinguish between wetland sites. Combined, they should be able to provide greater spatial accuracy in identifying the wetland at which the feather was grown. With the knowledge that wetlands have their own unique elemental and isotopic signature, we are expanding the study nationally. Sunset at an ibis colony. The Feather Map of Australia is a citizen science project that aims to map the signatures for as many wetlands across Australia as possible. To do this we have asked interested members of the public to collect feathers from their local wetlands and contribute them for analyses. Once analysed, we will have an isotopic map of wetlands against which we can track waterbird movements. Feathers collected from chicks and birds that don’t move large distances will provide us with a signature for that particular wetland. We can then analyse the feathers of birds that do travel long distances and match the signature in their feathers against those of wetlands, telling us where these birds have been. The signature will not tell us all the movements a bird has made, but it will tell us where it was when it grew the feather. And this will also give us information about the health of the wetland based on what food the bird has eaten and how long it took to grow the feather. Knowing the movements of waterbirds helps identify wetlands that are important waterbird habitats. This knowledge can be used to provide information to policymakers and land and water managers for improved water delivery, wetland management and decision-making, and ultimately protect wetlands and waterbirds. Read more on how to send feathers to scientists and help build the Feather Map of Australia. The following link is to an article reporting on the latest at the Fukushima Daiichi Nuclear Power Plant in Japan, following the 2011 earthquake and tsunami. The situation is said to be contained, however this would seem to be only to a certain point.